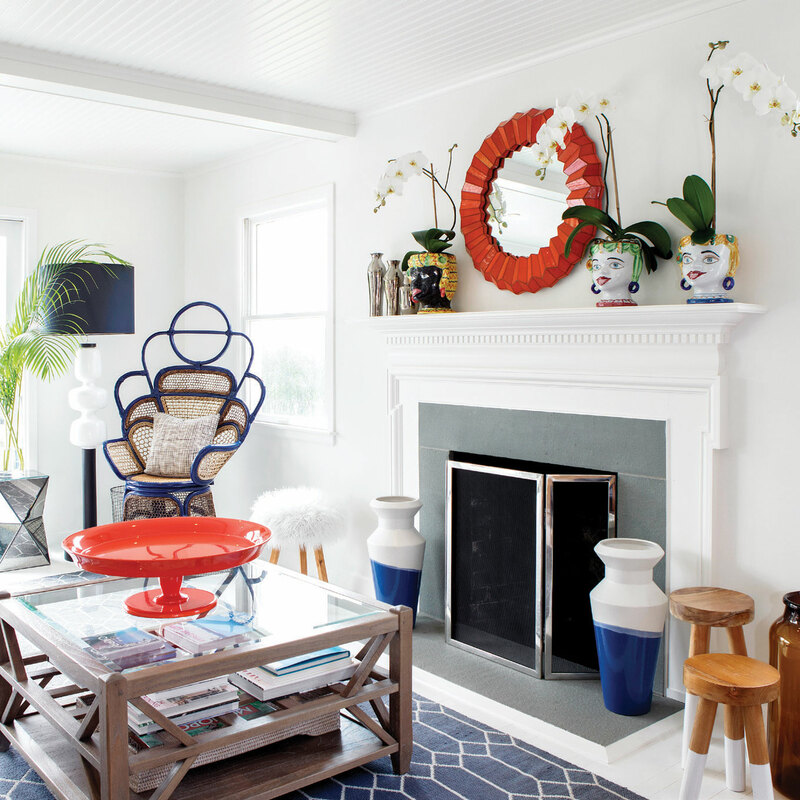 Beth Buccini, founder of the super-stylish Kirna Zabête apparel boutiques, relies on her own well-honed sense of style ot craft her family's upbeat, comfy beach house in Amagansett. Decked out in a Johanna Ortiz dress, $2,500, Buccini effortlessly blends glamour with ease. If you were to ask Beth Buccini about what’s trending in any of her ultrachic boutiques right now, she’d probably say her take on fashion is less about the flavor of the moment and more about a point of view. “Now anything goes—you should wear what fits your personality,” says the busy mother of four and founder of Kirna Zabête, an expanding designer clothing and accessories enterprise. “Shopping should be happy, joyful, fun,” she adds. The red-and-purple print sundress she’s wearing when we speak underscores that attitude and offers a clear cue to her own vibrant personality. 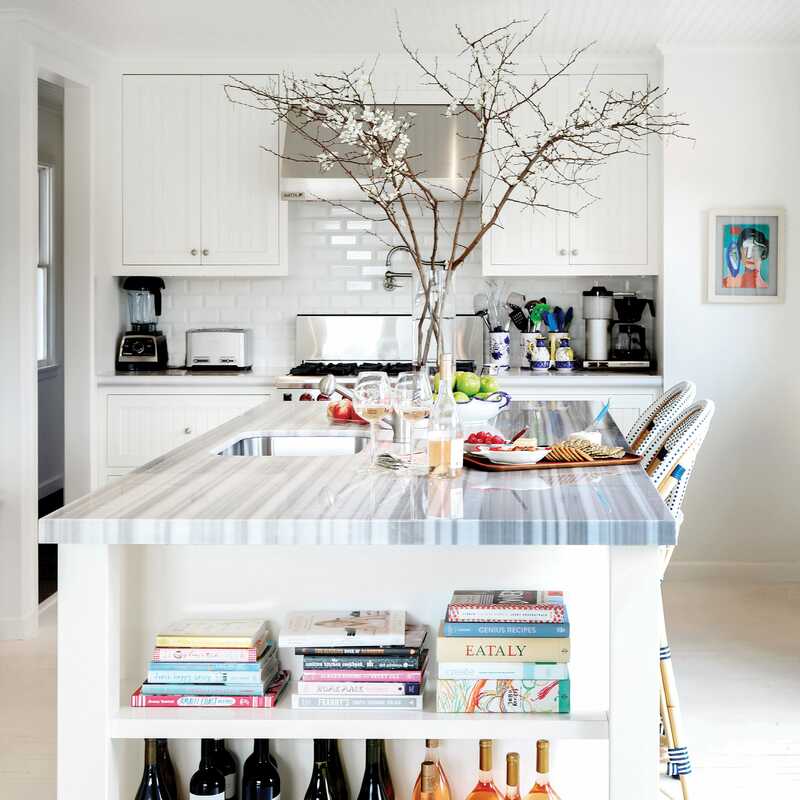 It also aligns with the lively yet relaxed spirit of her family’s Cape-style Amagansett beach house, which she decorated herself in short order. “We closed on the house while we were on a plane to Italy, and I went into a full panic, thinking, I only have three weeks to decorate it” before the season starts, she recalls. Thankfully, the house had just been renovated and was move-in ready with clean white interiors before they bought it. And with the help of a friend, the tastemaker and seasoned shopper pulled off the feat with finesse. Against a crisp white backdrop, a collection of furnishings, many from online sources like CB2, Serena & Lily and One Kings Lane, lends relaxed comfort to the living room. Vintage accents, like the head vases from Capri on the mantel, pep up the space with playful notes. Having grown up in a happy family in Virginia Beach, she also drew upon memories of her childhood as a source of inspiration for the upbeat tone of the rooms. “My parents were A-plus people—high school sweethearts—and our family Happy Home traveled to Capri every year and stayed at the same hotel—the Scalinatella,” Buccini explains. So while she was in Capri with her husband and children, she picked up some campy vintage ceramic-head vases and colorful blown-glass cocktail stirrers to inject some retro flair into their new home and remind her of the glamorous good times she enjoyed in Italy as a teenager. “Since I grew up in Virginia Beach, I’m really a beach girl at heart,” she says. “I love this house because it’s just a block from the beach and has a big yard where the kids can play and we can entertain.” In contrast to the family’s more formal and more colorful Pennsylvania home, their Hamptons house exudes a simpler, more laid-back air with a few vintage pieces layered into the mix. For really unique accents and furnishings, she went to local stores like Rum Runner in the Hamptons and Flair in Soho, and turned to online sources, such as One Kings Lane. “I love their vintage section. I was stalking that for days,” she says. Atop the kitchen island, crudités dishes in the shapes of various fishes are inspired by the passions of Buccini’s family members. “My brother is an aquatic biologist, my father a fisherman,” she says. Aside from reflecting her personality, her Hamptons home also suits her lifestyle. “I always knew I wanted to be a mom with lots of kids, even before I met my husband,” says Buccini, whose children often spend the day here surfing, biking or horseback riding. With her two boys, Shepherd and Balthazar, and two girls, Josephine and Virginia, all ranging in age from 9 to 15, she and her husband share a relaxed approach to parenting, which a friend once aptly summed up by saying, “If you have that many kids, you just have to embrace the chaos.” To aid in that process, the couple combined the boys’ bedroom with a play-and-entertainment space on the lower level of their beach house. “They can’t believe they have their own crash pad, where they can sleep and watch TV and play foosball,” says Buccini. The cheerful, low-maintenance home is ideal for the kids, but it also works really well for Buccini. “I knew I wanted a career, too, so I’ve opened stores in places that fit with my life,” she adds, which explains why she recently launched her fourth and newest store in East Hampton (she’ll be hosting events there with a few of her favorite designers and fashion editor friends this summer). “It lets me be the mother I want to be and the professional I want to be.” Indeed, and with amazing style, too.